A good way to understand the Camino is to have other people who have done it talk about their experience. The first in what I hope to be a series of interviews is Bénédicte from France. Bénédicte also has her own Camino website 'La Coquille' (link also in the sidebar). 1. Why the Camino de Santiago? When I was ill in the hospital, in my bed, I heard a voice telling me "Stand up and walk! ". I didn't believe in God and I thought I was becoming crazy! When I returned home, I watched the TV and saw a report on Santiago. I thought to myself, " I must go there!". My family was initially very worried about me but they let me go. In the beginning, I walked just a little, but after that I became a good walker! 2. You have done the French segment from Le Puy en Velay to Pampelune (Pamplona) and now you have completed the Spanish segment from Pampelune (Pamplona) to Santiago de Compostela. How would you compare the difference between the 2 segments? On the french part, there were few people. I walked alone very often, but I loved it. But on the spainish way, there were many pilgrims from abroad, and I had to speak English. It has been very difficult for me as I wanted to be alone with my thoughts. But I was alone for such a long time that I realized that being with people was good for me. Even the last 15 days when I walked with Rosalinda, I really enjoyed it! 3. What is your biggest discovery you have made after you embark on your camino? My biggest discovery has been every people I met along the way , and especially with the ones I am very close to (like you !!!). I like listening to their life, and telling them mine. There were pilgrims who believed in God, and other which didn't, and I could ask them my question about religion and every other things. I was always the first to speak about God and nobody laughed at me! They listened me seriously. 4. Finally one more question, how do you keep your complexion so smooth in the harsh outdoors of the Camino. What is your secret? It was easy for me to be in good mood and to smile and laugh, because everyone next to me were very nice and interesting and I was so happy to walk with them, and to realize this wondeful experience! 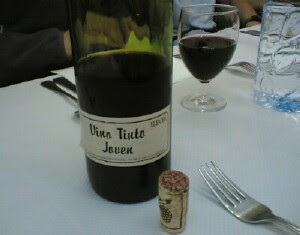 Don't forget that every evening we drank "Vino Tinto" and that was really good for the mood! And don't forget also that I'm from France, the famous wine country! 5. No seriously, what is your secret? My beauty secret is the new L'Oréal cream for my face!